Where do the arts, affordable housing, local transportation and programs involving weatherization and micro-business all come together? Welcome to Project Space 9 Bellows Falls 05101, a gallery space located in the Exner Block in downtown Bellows Falls is showcasing a variety of initiatives developed by Connecticut River Transit, Rockingham Area Community Land Trust, Southeastern Vermont Community Action and the Rockingham Arts and Museum Project (RAMP). McBride also wanted to make sure that residents and visitors understand that despite the global economic down turn, in our rural community there are social, economic and cultural organizations that are working and developing creative effective strategies to carry on and enhance our quality of life. Gary Fox, executive director of Connecticut River Transit (CRT), was enthusiastic when approached about participating in Project Space 9; he saw the potential for offering CRT to tell its story to a larger community. CRT connects communities along the Connecticut River in Windsor and Windham Counties serving people of all ages and their needs, getting them where they need to go. Rockingham Area Community Land Trust (RACLT), for over twenty-five years has helped build the community by providing affordable quality housing, sometimes developing new buildings and more often renovating buildings bringing them up to code, supplying well designed, safe housing at affordable rents. Russ Brink who is the current director of RACLT, shares their story through a renovation of buildings on William Street in Bellows Falls. On the Square in downtown Bellows Falls, the Howard and Exner Blocks are shining examples of RACLT contribution to the renovation of the downtown, stepping forward at a time when private development was not an option. When you visit Project Space 9 in the Exner Block look around you and notice the fine attention that was paid to the renovation, the pressed tin inside and outside is a unique architectural feature. The Exner Block provides ten affordable live/work spaces for artists and six retail spaces with a focus on the arts. Steven Geller, executive director shares the story of two of their programs involving weatherization and micro-business and the short, mid and long term positive impacts that they have. Space 9 allows for the integration of these other stories into the exhibit before it ends in May. 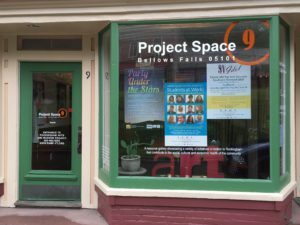 Project Space 9, opens Thursday, February 26, 5-7 PM at the Exner Block, #9 Canal Street off the square in downtown Bellows Falls. The public is invited and encouraged to come meet the executive directors of these vibrant programs. The windows of Project Space 9 will be changed regularly and will be lighted at night in order to highlight the projects. So walk by and take a look. The gallery will be open seven days a week 10-5 PM. The gallery is wheel chair accessible. 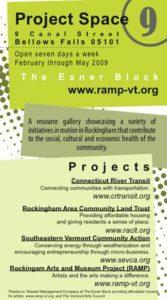 For more information contact RAMP, 802-463-3252, ramp@sover.net, www.ramp-vt.org.